Long Put is a basic options trading strategy. It involves buying a put option, that is the choice to sell the option at a predetermined price at the time of expiry. The strategy gives the trader a right to buy the put option on expiry, but not the obligation. The trader may choose to buy the option or not. One of the most important aspects you need to understand is that a “premium” needs to be paid for buying the put option. 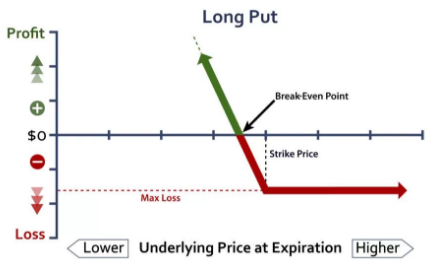 Long Put is used when the trader has a bearish view on the market and expects the price of the asset to go down. He will then wait for the prices to go down and then exercise his option. If the price goes up, he can choose to not exercise his option and let it expire worthlessly. The only loss will be the amount of premium paid. However, the profit potential is unlimited and keeps on increasing as the price of the asset goes down. The long put strategy is opposite to the long call strategy in which the trader is bullish towards the market and will make a profit if the price of the underlying goes up. The long put is also quite similar to short selling of shares. However, as compared to short selling, long put is more convenient and less risky. While short selling, the risks can be unlimited, while they are capped at the amount of premium in the long put. The most suitable time to use a long put strategy is when the trader is highly bearish towards the market and expects it to go down sharply. When this situation arises, the trader buys a put option on the underlying and waits for the prices to go down. If the prices go down, he can earn profits and if the price goes up, he can choose not to exercise his option and close the position by paying the premium. As compared to short selling of shares, the trader does not have to make an initial investment of buying the shares upfront. Also, if the price goes up, the trader is not obligated to deliver the shares and can close the position. It is to be noted that the put does not appreciate with every rupee drop in the share prices, but the gains are still significant. The long put strategy is only suitable for bearish or neutral markets and is highly incompatible with the bearish markets. The maximum loss using a long put is capped at the amount of premium paid for buying the option. This situation occurs when the price of the underlying is more than the strike price of the long put. The maximum profit is unlimited and is calculated by deducting the amount of premium paid from the strike price of the long put. The maximum profit situation arises when the price of the underlying asset reaches zero. Let us study an example to understand the long put in detail. For this example, NIFTY is considered to be at 8900 points, with a lot size of 25. The trader expects the market to go down drastically and therefore buys a put option with a strike price of 8800, at a premium of ₹400. 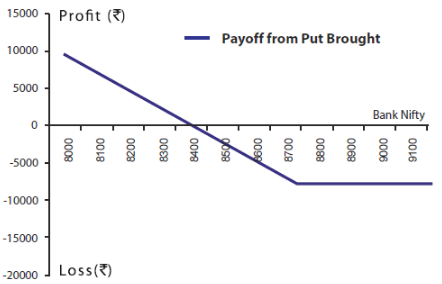 If NIFTY closes at 8000, which is much lower than the current price, the strategy will generate profit. The profit from the put option will be (8800-8000)= ₹800. However, after paying the premium of Rs 400, the net profit will be (800-400)= 400*25= ₹10,000. If NIFTY closes further down at 7800, the profit generated from the put option will be (8800-7800)= ₹1000, and the net profit will be (1000-400)= 600*25= ₹15,000. Thus, the profit will keep on increasing as the price keeps going down and it will be maximum when NIFTY closes at ₹0, hypothetically. However, if NIFTY closes at 9000, which is higher than the current price, the trader will incur a loss. The trader will choose not to exercise the put option so the option will expire worthlessly. The total loss will be equal to the premium paid, which is equal to 400*25= ₹10,000. This is the maximum loss from the strategy, even if the price goes very high up. If NIFTY closes at 8400, the trader will use the put option and the profit will be (8400-8000)= ₹400. However, after paying the premium of ₹400, the net payoff from the strategy will be 400-400= ₹0. This is the break-even point of the long put strategy and is equal to the strike price of the long put, minus the premium paid, (8800-400)= ₹8400. The long put strategy has the potential to generate unlimited profit. The profits are earned even the prices are going down in the bearish market. The premium paid is high and negates a part of the profit. As a bottom line, long put is a very effective strategy. It is simple and easy to execute. The strategy can even be used by beginners without the fear of losing much. The strategy helps to make profits in the bearish market. The most important benefit is that the trader has the right to exercise or not exercise the option. Due to this, the risk becomes limited and the profit becomes unlimited. At the same time, some consideration needs to be given to the timing of execution of the long put strategy. Timing is of the essence. The trader must observe the prices and keep on re-evaluating the strategy before the expiration date. He may wait till the last day of expiry or may close the position sooner. All in all, long put is an effective options trading strategy with limited risk and unlimited reward potential. In case you are looking to invest in options or share market in general, let us assist you ahead. Module 11: Options Trading How Options Pricing is done?